Intel announces Neural Compute Stick 2 (Intel NCS 2) for building smarter AI edge devices. Intel Corporation today introduces the Neural Compute Stick 2 at Intel AI Devcon in Beijing. Designed to build smarter AI algorithms and for prototyping computer vision at the network edge, the Intel Neural Compute Stick 2 enables deep neural network testing, tuning and prototyping, so developers can go from prototyping into production. 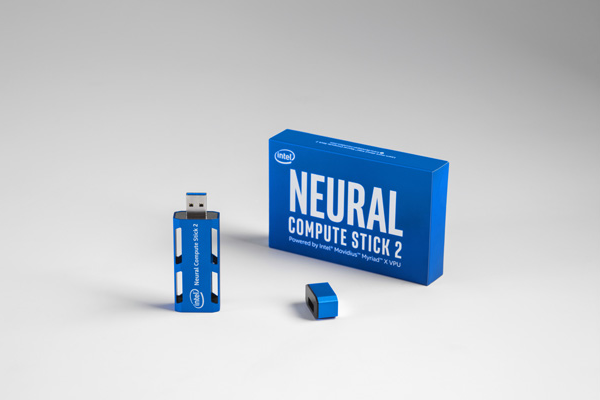 The Intel Neural Compute Stick 2 (Intel NCS 2) designed to build smarter AI algorithms and for prototyping computer vision at the network edge. Based on the Intel Movidius Myriad X vision processing unit (VPU) and supported by the Intel Distribution of OpenVINO toolkit, the Intel NCS 2 affordably speeds the development of deep neural networks inference applications while delivering a performance boost over the previous generation neural compute stick. The Intel NCS 2 enables deep neural network testing, tuning and prototyping, so developers can go from prototyping into production leveraging a range of Intel vision accelerator form factors in real-world applications. What It Does: Bringing computer vision and AI to Internet of Things (IoT) and edge device prototypes is easy with the enhanced capabilities of the Intel NCS 2. For developers working on a smart camera, a drone, an industrial robot or the next must-have smart home device, the Intel NCS 2 offers what's needed to prototype faster and smarter. What looks like a standard USB thumb drive hides much more inside. The Intel NCS 2 is powered by the latest generation of Intel VPU - the Intel Movidius Myriad X VPU. This is the first to feature a neural compute engine - a dedicated hardware neural network inference accelerator delivering additional performance. Combined with the Intel Distribution of the OpenVINO toolkit supporting more networks, the Intel NCS 2 offers developers greater prototyping flexibility. Additionally, with the Intel AI: In Production ecosystem, developers can now port their Intel NCS 2 prototypes to other form factors and productize their designs.